Recent years have seen a resurgence of separatist sentiments among national minorities in many industrial societies, including the United Kingdom. In 1997, the Scottish and Welsh both set up their own parliamentary bodies, while the tragic events in Northern Ireland continued to be a reminder of the Irish problem. These phenomena call into question widely accepted social theories which assume that ethnic attachments in a society will wane as industrialization proceeds.This book presents the social basis of ethnic identity, and examines changes in the strength of ethnic solidarity in the United Kingdom in the nineteenth and twentieth centuries. 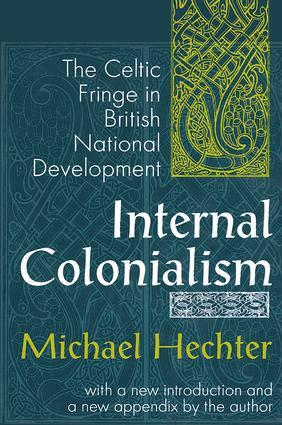 In addition to its value as a case study, the work also has important comparative implications, for it suggests that internal colonialism of the kind experienced in the British Isles has its analogues in the histories of other industrial societies.Hechter examines the unexpected persistence of ethnicity in the politics of industrial societies by focusing on the British Isles. Why do many of the inhabitants of Wales, Scotland, and Ireland continue to maintain an ethnic identity opposed to England? Hechter explains the salience of ethnic identity by analyzing the relationships between England, the national core, and its periphery, the Celtic fringe, in the light of two alternative models of core-periphery relations in the industrial setting. These are a diffusion model, which predicts that intergroup contact leads to ethnic homogenization, and an internal colonial model, in which such contact heightens distinctive ethnic identification.His findings lend support to the internal colonial model, and show that, although industrialization did contribute to a decline in interregional linguistic differences, it resulted neither in the cultural assimilation of Celtic lands, nor in the development of regional economic equality. The study concludes that ethnic solidarity will inevitably emerge among groups which are relegated to inferior positions in a cultural division of labor. This is an important contribution to the understanding of socioeconomic development and ethnicity.